America is a nation of chili heads. It’s a long-standing and storied love affair. When working on a film in Italy, chili-craving Elizabeth Taylor ordered 20 quarts of her favorite recipe from LA’s legendary Chasen’s restaurant flown to her in Rome — at $100 a bowl. After moving to Washington, D.C., Lyndon Johnson couldn’t find good chili, so he filled his kitchen shelves with canned Texas chili to survive the chili drought. Humorist Will Rogers once said he judged a town by the chili it served. So passionate are chili lovers that they began putting recipes to the taste test in chili cook-offs across the nation. One of the oldest, the Chili Appreciation Society International Championship Contest still holds its annual cook-off in the tiny town of Terlingua, Texas, drawing thousands of visitors each year. Seems everyone has a favorite, including Emeril Lagasse. We invited the longtime football fan to share his Kickin’ Chili recipe and pre-game strategy for throwing a stress-free party. “At my house, game day is an open invitation for my friends and family,” Emeril says. “The key to entertaining at home is prior planning, so everything goes smoothly. Cook and prep what you can in advance. On game day, heat up the chili, serve with a spread of toppings, and let guests build their own bowls.” Game on! Heat oil in large heavy pot over high heat. Add beef and brown well, about 10 minutes. Add onions, chili powder, cumin, Southwest Essence, cayenne, cinnamon, crushed red pepper, and bay leaf and cook, stirring often, until onions soften, about 8 minutes. Add garlic and cook until fragrant, about 30 seconds. Add beer and cook until foam subsides, about 1 minute. Add tomatoes, tomato paste, salt, brown sugar, and chocolate to pot. Stir well and bring to boil. Reduce to simmer and cook until slightly thickened, about 1 hour, stirring occasionally to prevent chili from sticking to bottom of pot. Skim off as much fat as possible. Add beans, return to simmer, cover, and cook until thickened, about 1 ½ hours longer. Serve with cheese if desired, green onions, and cilantro alongside as garnish. Note: To make 6 cups cooked red kidney beans, soak 1 pound dried beans for 6 hours or overnight. Drain beans and place in large saucepan. Add water to cover by 2 inches and bring to boil. Reduce heat to simmer and cook until just tender, 30 to 45 minutes. Drain and set aside to cool. Season chicken with 1 1/2 teaspoons of salt, 1 teaspoon of cumin, and 1 teaspoon of chili powder. Set a pressure cooker to t “browning” program and heat olive oil. When it is hot, add chicken breasts (in batches if necessary) and cook until they are golden on both sides and just cooked through, 8 to 10 minutes. Transfer chicken to plate, tent it with foil or plastic wrap, and set aside. Add onions, poblano and serrano chiles, cilantro stems, chipotle chile, garlic, oregano, remaining 2 1/2 teaspoons cumin, and remaining 1 teaspoon chili powder to pressure cooker. Cook, stirring occasionally, until vegetables are soft, 5 to 6 minutes. Add beans, chicken stock, and canned chiles. Close and lock lid, and set to “high pressure” for 15 minutes. While beans are cooking, shred cooled chicken into bite-size pieces and set it aside. Open pressure release valve and allow the steam to escape. Unlock and carefully open the lid. Add the remaining 1 tablespoon salt and the cornmeal, and stir to combine. Close and lock lid, and reset to “high pressure” for 8 minutes. Release pressure, unlock, and carefully open lid. Beans should be tender; if not, continue to cook them under pressure for 1 to 2 minutes longer. Set pressure cooker to “simmer” program. Stir in chicken and cook, uncovered, until chicken is heated through, about 10 minutes. Serve chili in bowls, garnished with sour cream, lime wedges, minced red onion, minced jalapeños, grated cheese, and cilantro leaves. Combine chili powder, cumin seeds, cayenne, cinnamon, oregano, bay leaves, and brown sugar in small bowl; set spice mixture aside. Add beef to medium bowl and season with pepper and 1 tablespoon of the kosher salt. Heat 2 tablespoons of vegetable oil in 12-inch or larger skillet over high heat. Add enough beef to fill pan and cook until nicely browned on one side, about 2 minutes. Turn pieces over and cook for another 2 minutes. Transfer browned beef to crock of a 6-quart slow cooker. Repeat with remaining beef, adding remaining vegetable oil between batches as necessary. Add onions, celery, and 1 tablespoon of remaining salt to skillet and cook, stirring, until vegetables begin to soften, about 2 minutes. Add garlic, jalapeños, and spice mixture and cook for 1 minute longer. Pour in beer, tomato paste, and crushed tomatoes and simmer for 3 minutes. Stir in chocolate, masa harina, and remaining 1 1/2 teaspoons salt and cook for 1 minute longer. Transfer this mixture to slow cooker. Cover and cook chili on high, undisturbed or stirring only once during cooking, for 6 hours, or until beef is very tender. Remove bay leaves and stir in cilantro and parsley. 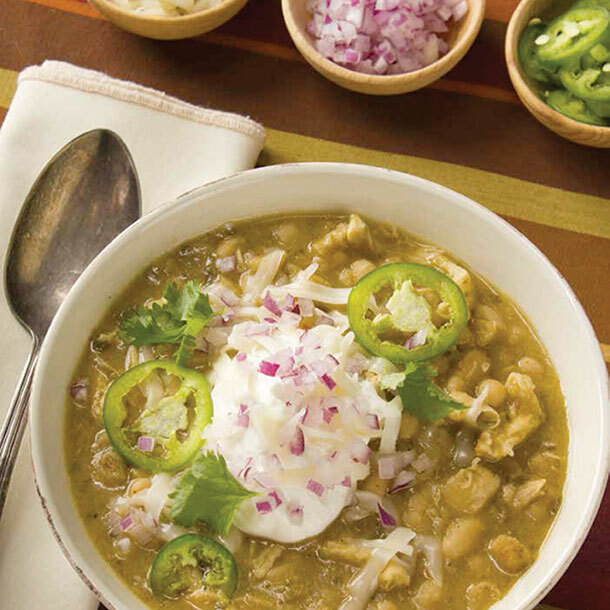 Serve the chili hot in bowls, topped — if desired — with grated cheddar, chopped green onion, and sour cream (optional). Note: Optional sour cream and cheddar cheese not included in final calculation below. Brown chili grind, drain off grease. Add beef broth, tomato sauce, and 1st spice mix. Bring mixture to a boil, then reduce to simmer for 50 minutes, then add 2nd spice mix and simmer for 30 minutes. During this time if liquid is needed you may use more beef broth, also salt and heat can be adjusted to your liking by adding table salt and cayenne powder. Where can I find Mexene and Mild Bill’s spices???? I’m in Capital District New York (upstate). Please advise. Always interested in trying new recipes.